When I was on a training run in Central Park a few days ago I was thinking about something someone said to me when I presented the river run project to the Orange Runners Club on January 4th. After my presentation, my friend Rob approached me and said “Todd, I don’t know how well you know the Adirondacks in May, but you’re gonna have a problem there – black flies!” I told Rob that as a boy, I spent a lot of time up in the ‘dacks (as we call them), and was pretty well acquainted with the black fly issue. For those of you who don’t know, black flies are an especially annoying variety of flying pest, seeming to prefer mountainous terrain and the plant growth that is predominant there. The thing with black flies is that – unlike mosquitoes – they tend to swarm, and they don’t settle on you, get comfortable, and then inject a needle into you. Instead, the black fly bites, and it does so almost immediately. So imagine if you will a couple dozen of these pesky biters swarming around your face and chomping into you several at a time. This is not a pleasure. Fortunately, the black fly doesn’t deal well with heat, which is probably a big reason why it inhabits the mountains instead of the lower elevations where human populations are more prevalent. 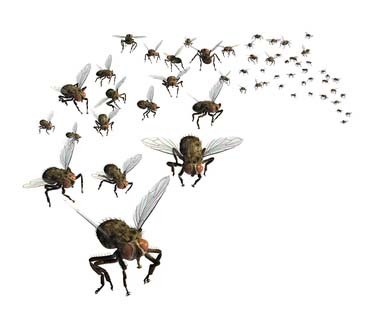 With a few consecutive days in the 80s, the majority of black flies will actually die, leaving hikers, boaters and other outdoor types free of the black flies’ less-than-trivial annoyances. But the problem is, in the Adirondack Mountains, a run of hot days like that typically doesn’t happen until early July in most places, so my visit to the High Peaks in mid-May will be at the time of high feast for those nasty flies! This entry was posted in Running and tagged Adirondacks, black flies, Hudson River. Bookmark the permalink.